Imagine a world where you no longer need to actually drive your car – instead, you can just climb in and let it do all the hard work for you. With innovations in automation evolving as fast as they are, driverless vehicles are swiftly becoming a realistic and affordable possibility. In fact, some industry experts predict that there could be up to 10 million self-driving cars on the road by 2020. But what comes after the act of driving is taken away? What can possibly replace the thrill of the open road? With an eye on the future, Nissan’s creative team has come up with a fun and inventive way of providing the same excitement that driving can offer, by transforming its cars into giant Playstation consoles. 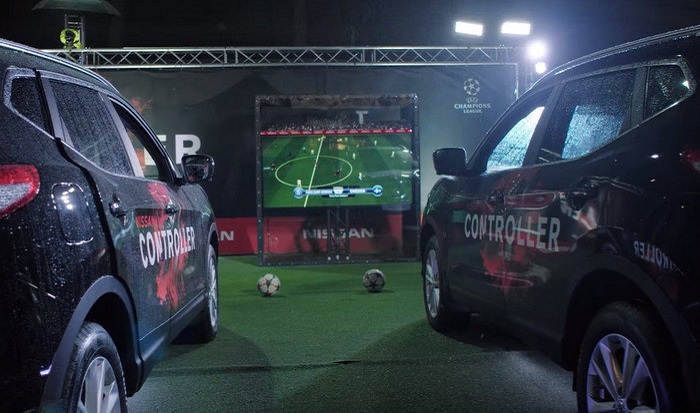 Fans at a recent UEFA Champions League match in Sweden had the chance to experience this for themselves when Nissan, Sony and Konami teamed up to create ‘The Controller,’ a concept product that gave match attendees the opportunity to try football gaming like never before. Those lucky enough to take part in the memorable brand experience were challenged to put both their driving and football skills to the test by playing a very unique version of Konami’s popular Pro Evolution Soccer game. Instead of using the familiar Playstation controller though, gamers took to the driving seat of a Nissan Qashqai, playing the game by using the car’s steering wheel and pedals! The innovative Controller box works by creating a link between the Nissan vehicle computer and a Playstation game console, enabling the car to have all the same functions as a normal controller. Much like Smart Automobile’s quirky interactive ping-pong game activation, Nissan has shown with ‘The Controller’ that the automotive industry is perfectly placed to serve up incredible brand experiences. The experiential stunt, developed in close partnership, was so successful that Nissan will be taking it out for another spin with outings planned at gaming conventions, automotive events and more UEFA Champions League matches throughout 2016.